As a parent it is your responsibility to raise responsible humans and to make sure that your children get the best education possible. How to teach children about money is an important part of the education of your children, because if they don’t know how to handle money, they could find themselves in a lot of hot water in the future. Many schools don’t even teach money handling to the youth, so if you don’t do it, who will? It is never too early to start to teaching your children about money. Judging by the amount of credit card debt worldwide, it is a scary thought that most adults don’t know too much more about managing their financial affairs than children do. 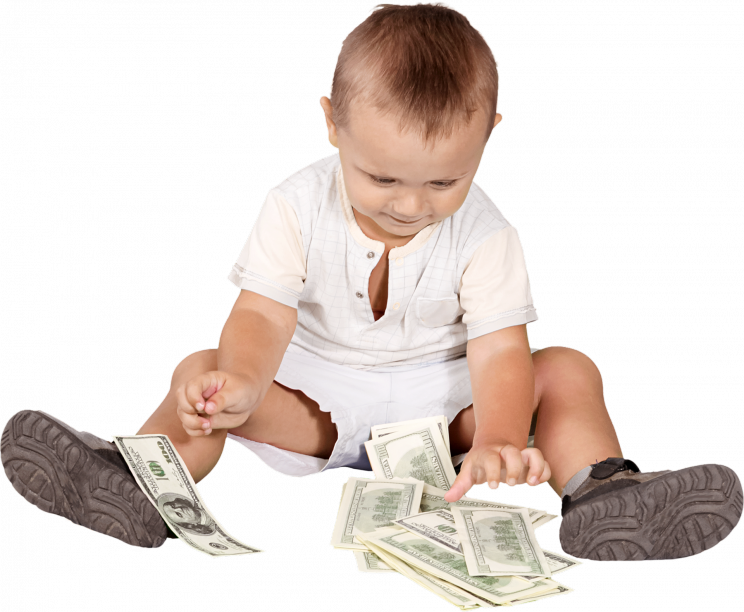 Believe it or not, children as young as three years old can already grasp the concept of saving and spending. By the age of seven years old, a child’s money and spending habits are formed (scary thought). As parents, you need to take advantage of everyday money teaching moments. Having three separate labelled jars can help your child to allocate his or her money as they get it, and not end up putting into saving or charity only what they have left over at the end of the month. Try and encourage them to allocate 10 percent to charity, and another 10 percent, if not more, into their savings account. Open a savings account for your child and take him to the bank with you when you put the money into it. Help your children to understand the difference between needs, wants and wishes. This will prepare them and help them to spend their money wisely in the future. Next you need to encourage your child’s entrepreneurial skills. Let him or her think up ideas of how they can make some extra money. Don’t simply create jobs for them so they can earn. Let them come up with the idea, and hire your child if it is something of use to you. An allowance should not be swapped for regular chores, but each child should have age appropriate chores that they need to do as members of the family, without saying. Whenever you go shopping with your child, use the experience as a learning one. If you pay with a credit card, explain to your child that the money will need to be paid back by you in full by the end of the month in order to avoid interest. Even better, teach your children that it is best to have credit on their credit, which earns them interest and doesn’t put them in debt when they spend. With young children it is far easier to explain actual cash being spent, than plastic. If you child wants something expensive, teach them the value of saving for the item by putting money aside for it each month. Don’t lend your child the money to buy it, or he or she will get too used to instant gratification, which is a huge problem worldwide. It is much more rewarding to save for something and then to buy it cash and not have to owe anything on the purchase. My father always said that you should only ever borrow money to buy a house and only if you really have to, a car. Show your child ways in which you can economize at home and save money. Simple things like saving water, using left overs wisely, or buying in bulk when there are specials all help to educate him or her. Have regular family discussions about money and how to save it. Think of practical ways on how to teach your children about money at appropriate opportunities. As parents you need to set an example for your children. Children always copy what they see at home, and if they see you spending excessively, this is exactly what they will do. Great article on How to teach Children about Money. I recently read a great book “Poor dad, rich dad” by Robert Kiyosaki – has some great advises how to teach your child to appreciate money. Hi Michael, thank you for the information. Although I don’t have any child, I have siblings and friends that already have kids. Even one of my friends has a daughter who recently turned 5 years old. I agree with you that we should teach about importance of money when they are small. This way, hopefully they can grow with awareness of money. I love the part in your article about teaching your child to develop their entrepreneurial skills. The education system is teaching children to be employees and not business owners. It does start at home like all the other things we teach our children before they have to go out into the world. I think they should be taught investing also at a young age. The book idea is also great. Thank you Raquel. Nice website, and I can see you’ve been around for awhile. Congratulations! You have a lot of good information for the affiliate marketer and a lot of other information as well. How is all this working out? My comment on this is that it seemed to bring too many ideas and unrelated topics into view at the same time. I was also distracted by the ads and the column on the right you labeled “Sponsors”. I found a lot of good Internet marketing information, which I take it is your focus. Wealthy Affiliate came up a number of times. Is WA where you make most of your money online? Or does everything else provide more? Just curious, because I got lost along the way of looking at different posts and recommendations you made. And at one point I found I couldn’t get back to the original page where I had started. You’ve got a lot of good information here. My basic comment would be to organize it in a more meaningful manner. This site has evolved over a number of years. My primary focus is on Website Creation and Wealthy Affiliate, but the other recommendations I make are sites I have been a member of for years and that are still working for me – mostly in the way of advertising. Hopefully as I work more on the site, it will become less confusing. I think most children pick up a lot of their ‘money behaviors’ from their parents. For example, my parents are quite thrifty and I learn from a very young age that money doesn’t come easily and that you must always save for rainy days. These days, I see a lot of kids get what they want and although I like to see them happy, I hope they can learn the value of saving and earning money which will help them create a better future. You are so right Cathy, and it is our responsibility to teach our kids to save from a early age. Instant gratification is all to rife these days.